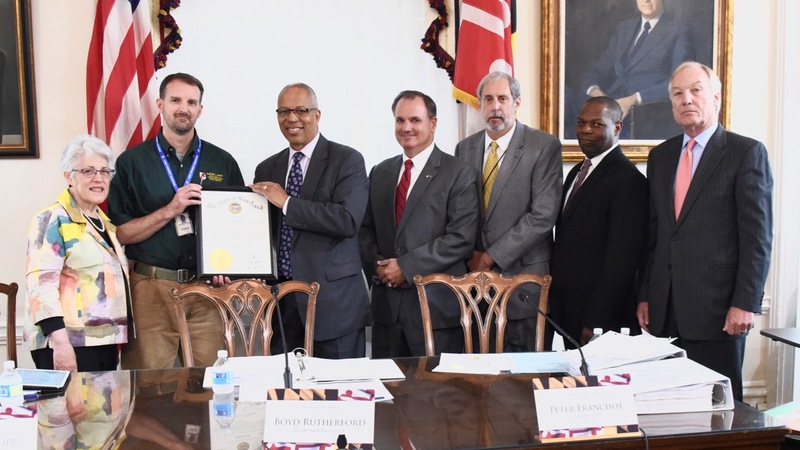 Maryland Department of Natural Resources employee Brian Stupak was honored by the Hogan Administration today with the Customer Service Heroes Award for July. Stupak, a project manager with the Maryland Forest Service, was presented a citation by Lieutenant Governor Boyd Rutherford before the July 26 Board of Public Works meeting. Stupak was nominated by the Department of Natural Resources and selected by Governor Larry Hogan. Stupak supervises a three county project area and is the primary forester for Calvert and Prince George’s counties. He provides and implements forest programs in these counties, including assisting landowners with forest management, coordinating tree planting activities, managing state forest lands and other duties and responsibilities. One example of Stupak’s commitment to customer service was his work with the Town of University Park in 2016 and 2017. After a timber harvest was completed in a neighboring area, University Park officials complained about damage to a nearby stream, which feeds into the Anacostia River. Although his part of the work was technically finished, Stupak committed himself to investigating the cause of the issue and worked closely with Mayor Len Carey and Prince George’s County to determine that the damage was most likely caused by runoff from a nearby school, not the harvest. Through Stupak’s persistence and tireless commitment to customer service and willingness to collaborate with inter-agency partners, the issue was dealt with in an accurate and timely manner. The Customer Service Heroes Award was created by Governor Larry Hogan in 2016 to recognize individuals who have demonstrated and exceeded the expectations set within the Customer Service Promise.